Summer is coming to an end which signifies several scenarios. One is that the new school year is about to begin. Number two is that the fall season for sports teams is revving up. Three is that organizations are again starting to look for ways to fund their projects for the upcoming Autumn and Fall. All these scenarios suggest the opportunity for local community fundraising for the respected communities in West Los Angeles. One exciting way to raise money is by going through your favorite local eatery here in West Los Angeles: Benny’s Tacos! We host fundraisers to help schools, local sports teams, youth groups, charities, and other organizations to help raise income for their cause. Benny’s Tacos has now become a staple in the Los Angeles and Santa Monica community where relationships are built between several establishments, community programs, and us. We invite every organization with a worthy cause to hold their fundraisers at Benny’s Tacos, utilizing our delicious Mexican food menu and our sales and giving them a percentage of it. No doubt, one of the main obstacles of fundraising is the effort, coordination, planning, and execution. Budget, marketing, timing are also key factors. By conducting a local community fundraiser with Benny’s Tacos, these obstacles will be minimal and become much simpler. 1) Contact us at one of our locations and then pick a date and time. Fundraisers with us are only held Monday-Thursday during business hours. 2) Your organization must design a flyer/invitation with all the information about the fundraiser and then print it out. Make copies and hand them out in your community. You can also leave some at our store. 3) On the day of the event, come and enjoy a meal with us! For all the people who comes into Benny’s with a flier, we will give you a check for 25% of those gross sales. So basically: bring the flyer to us, eat some delicious food, and the organization will get 25% of the sales! Local sports teams can update their equipment and their field. Schools can finally kick off some of their programs and produce better facilities. College groups such as sororities, fraternities, and clubs can raise funds for their projects. Charities can earn more donations to better the lives of people. So many benefits from a fundraiser. Benny’s Tacos has a stronger relationship in the community and we want to make our bonds even more so. Visit our local community fundraising page on our website learn more how you can initiate a local fundraising event at Benny’s to raise the money you need and have a good time. After years of serving wonderful customers in the Venice area, Benny’s Tacos has just moved to Westchester on West Manchester Ave. While we miss seeing so many of our regular diners, we are happy to welcome many new customers and invite our Venice friends to come dine with us. Although we have been at our new location for just a short time, our management is pleased to report that the community response has been nothing short of dynamite for Benny’s Tacos. We are grateful to the people of Playa Vista, Westchester, Playa Del Rey and other areas near LAX. If you are craving quick and tasty Mexican food near Loyola Marymount, LAX or Playa Vista, Benny’s Tacos’ is a convenient option. A key area of our growing customer base is college students in search of filling food near Loyola Marymount University. 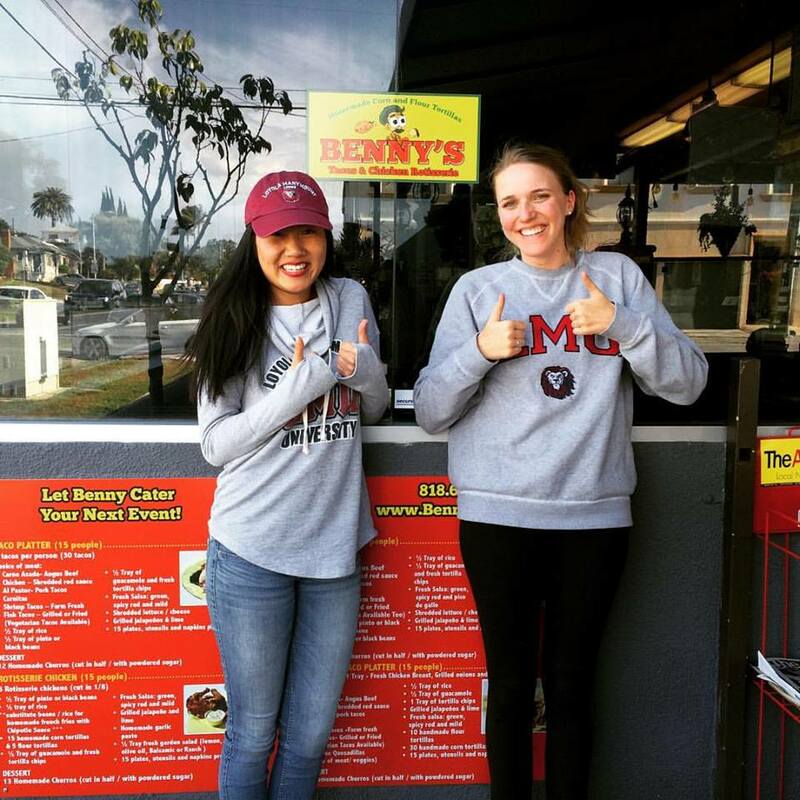 With extensive dining service options already, the addition of Benny’s Tacos to the LMU campus menu is keeping students satisfied during study breaks. We’ve been so privileged to associate with the best and brightest to come out of LMU that we now offer an LMU student discount at Benny’s Tacos. For all students of Loyola Marymount who present their student ID, we will shave off 10% from the cost of your meal! Stop by today to take advantage of this incredible promotion. With a range of options for all diets such as vegetarian or vegan, we are primed to welcome LMU students of all backgrounds and tastes into our restaurant. For off-campus students, give us a chance on your way back to your apartment and it’ll be all you need to satisfy your cravings at a reasonable price. Need a Late Night Option for Food Near Loyola Marymount? Benny’s Tacos is Open Late 7 Days a Week. Whether you’re cramming for a final exam or getting out of a late class, Benny’s Tacos keeps its doors open until 10pm during all days of the week. If you consider yourself an LMU newbie, here’s a hint: Make your first night out at Benny’s a Tuesday. With weekly Taco Tuesdays at Benny’s, you’ll get 3 street tacos, chips and salsa for just $5.00. For LMU students, the price goes down to $4.50. Kinda nice, right? So mark your calendars, gather your dorm together and make it a weekly ritual. End your quest to find the best food near LMU. We’ll be waiting.